I love coffee. I mean, I really love coffee. But drinking a cup of coffee a day really messes with my system, so I must find new and sneaky ways to get my coffee fix. And hey, I love chocolate too, so why not combine them? 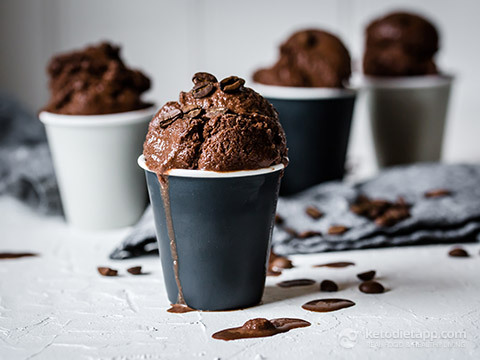 This low-carb sorbet is intensely flavoured with strong coffee and rich dark chocolate and is the perfect end to a dinner party. 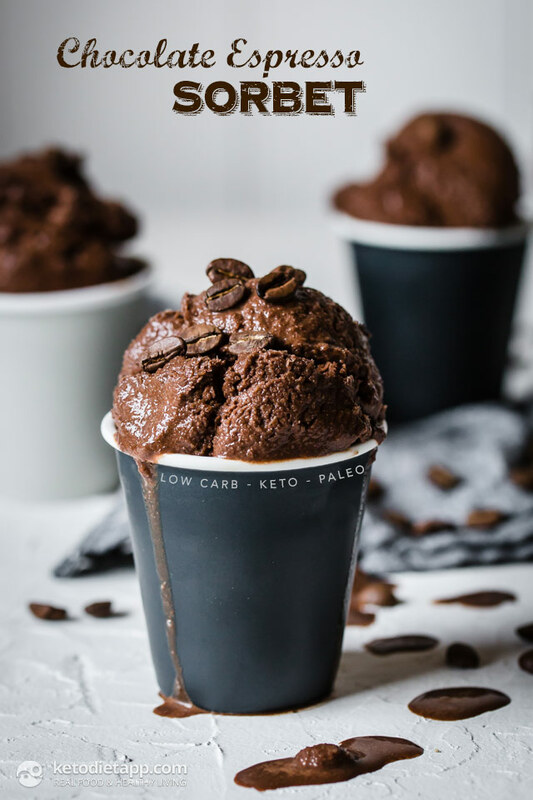 This keto-friendly frozen treat is not just sugar-free but also dairy-free and nut-free. Enjoy! Brew two cups of coffee. 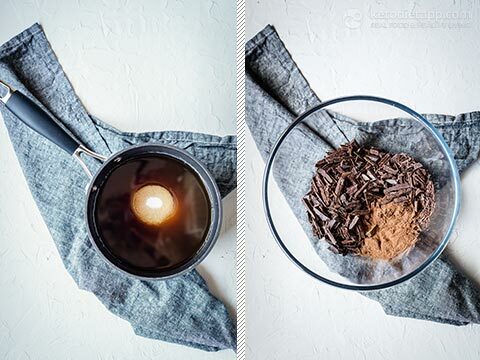 Place the water, coffee vegetable glycerine and sweeteners into a saucepan and heat until dissolved. 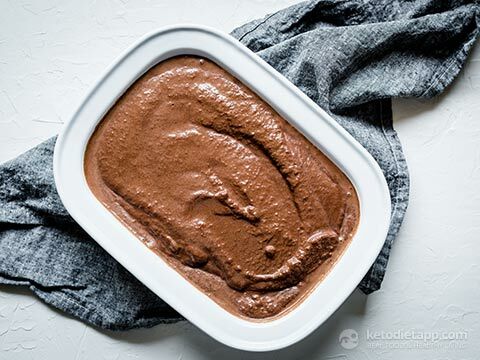 Finely chop the chocolate and place it in a heatproof bowl, along with the cacao powder. 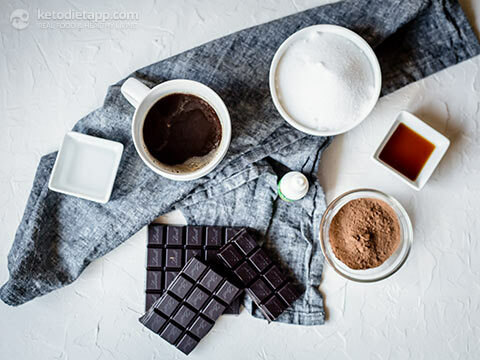 Pour the hot liquid over the chocolate and stir until melted and combined. Pour the mixture into a metal pan and place in the freezer for 6-8 hours (or overnight). Using a sharp knife or a pizza cutter, cut the frozen mixture into squares and place in a food processor. 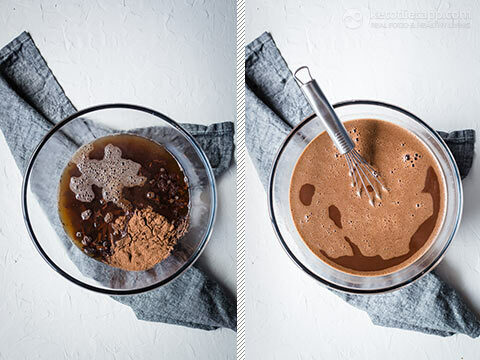 Blend until smooth and creamy and pour back into pan. Return to the freezer until firm enough to scoop, watching to make sure that it doesn’t re-freeze. 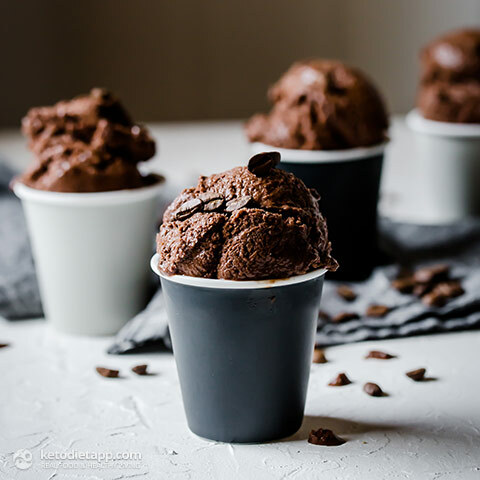 Serve scoops in small espresso cups as a lovely after dinner treat. Store in freezer, in a covered container, for up to four weeks, but it will refreeze and need to be blitzed again to scoop. 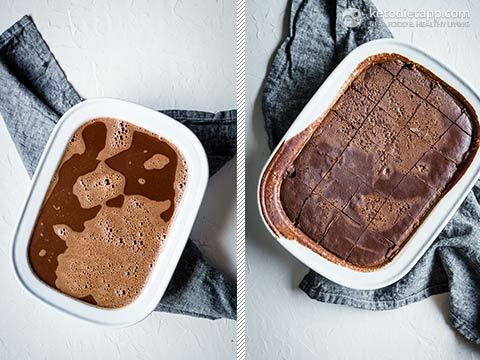 You can skip it or add 2 tablespoons of vodka (helps the ice cream to stay soft). Oh good I was thinking the same thing. considering organic gelatin for a replacement. Nice to know I do not need to use it. Naomi, are you sure about your serving sizes and number. I see about 7 cups of volume in the recipe and have made ice cream using the freeze and blitz method. I’ve never produced a product with that much over-run this way. You’re talking about about nearly doubling the volume of your product when you run it through the food processor. 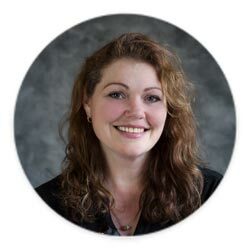 Hi Missy, it's about 8 cups of unfrozen volume. That was actually my own estimate based on other recipes I made. The volume will slightly increase when it freezes but it's more accurate to say that 2/3 to 3/4 cup is a serving (not about 1 cup as previously stated). This also depends on the ingredients (eg if you use whipping cream, the ice cream will be fluffier and less dense). The best way would be to weigh the ice cream - it's the only way you'll get an accurate serving size (~ 160 g/ 5.6 oz).